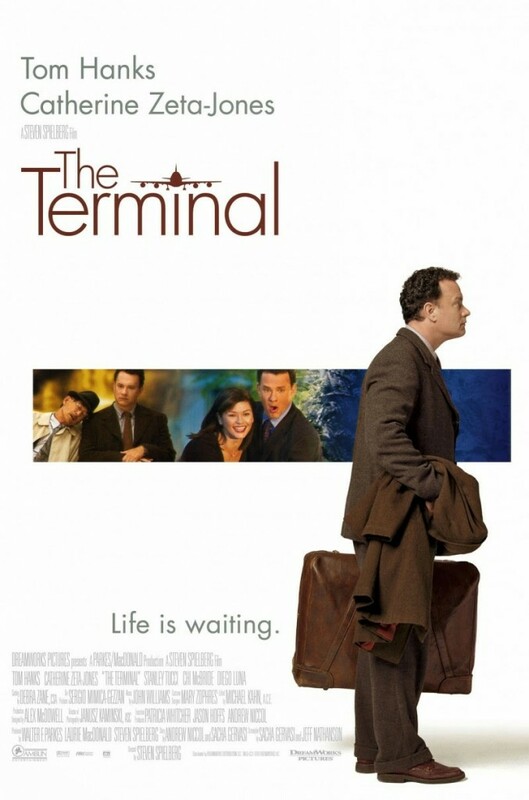 SUMMARY: Viktor Navorski (Tom Hanks) is forced to live in an airport terminal at JFK when he unknowingly becomes a man without a country. DETAILS: This fun film by Steven Spielberg is full of wit, humor and poignant moments. If you haven’t seen it, you should. And if you have seen it, I will encourage you to watch it again. While Viktor Navorski (Tom Hanks) is flying to America, his country (the fictitious Krakozhia) is overthrown, making his passport invalid and in turn causing Viktor to learn that for him, “America is closed”. His passport and return ticket are revoked by customs agents making him a man without a country who can’t enter America and who can’t return home. So he begins living at the unfinished Gate 67 in the international terminal at JFK. He learns to speak English, makes friends with some of the employees of the airport, becomes a matchmaker, falls for a beautiful stewardess (Catherine Zeta-Jones), and never gives up on his purpose of why he wants to come to America; a secret he carries with him in a can of peanuts.